Owen Griffiths scored the third Phantoms goal against Basingstoke last weekend. Phantoms cannot afford to drop another point if they are to be crowned NIHL Division One South champions. That’s the admission from head coach Slava Koulikov following the city side’s defeat against title rivals Basingstoke in a top-of-the-table showdown last Saturday. Phantoms were beaten 4-3 by the Bison who then leapfrogged them with another victory the following night to take over at the summit. The two sides are now locked together on points, but Basingstoke lead the way by virtue of boasting the better head-to-head record and they also have a game in hand. The two teams do still have to meet again at Planet Ice next month in what is likely to be a crucial clash. It’s one of eight remaining games for Phantoms and Koulikov has set his players the challenge of winning them all. Their run-in begins with a home date against Bracknell this Saturday (7pm) ahead of a trip to Streatham the following night (6.45pm). 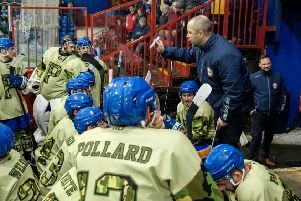 Koulikov said: “It was a big disappointment to be beaten in Basingstoke given I felt we were the better team, but unfortunately we gifted them all four of their goals. “The fact we lost doesn’t really change anything other than we have given away a lifeline. The title is still in our hands. “We have eight games to go and we must concentrate on trying to win them all. That is what we now need to do. “We’ll have a look at what went wrong against Basingstoke. I’ll tell the guys my opinion and they can share their views. But Koulikov is quick to insist the title is not merely a two-horse race - he also insists Swindon are serious challengers for the silverware. The big-spending Wildcats are currently five points behind Basingstoke and Phantoms, but they still have home and away clashes against the Bison to come. Koulikov added: “Swindon are right there and they have two big games against Basingstoke. “There are three teams who can win the title and we have to focus on ensuring we put in the performances to earn the results we need.